Trapped aboard a huge alien spaceship, you wander the corridors and meet weird aliens for all eternity, endlessly seeking a utopia you can never reach. Kind of heavy stuff for a 1980s Choose Your Own Adventure book. But it was real — and you could only win by cheating! I was fanatical about Choose Your Own Adventure books when I was a kid. I'd come home from the library with stacks of them. I actually started with TSR's Endless Quest books (Revenge of the Rainbow Dragons, which I acquired an old copy of recently, and let me just tell you, these things do not hold up 25 years later). Authors and publishers managed to push the innovative, non-linear story format of Choose Your Adventure in a lot of interesting directions before the fad fizzled. Some books featured math challenges, the resolution of which would direct you to the correct page. The Lone Wolf series was notable for basically being a solitaire RPG in paperback form. But one book always stood out to me, an unsettling little tale with countless unhappy endings and one really excellent ending that you could never reach. That book was Inside UFO 54-40. 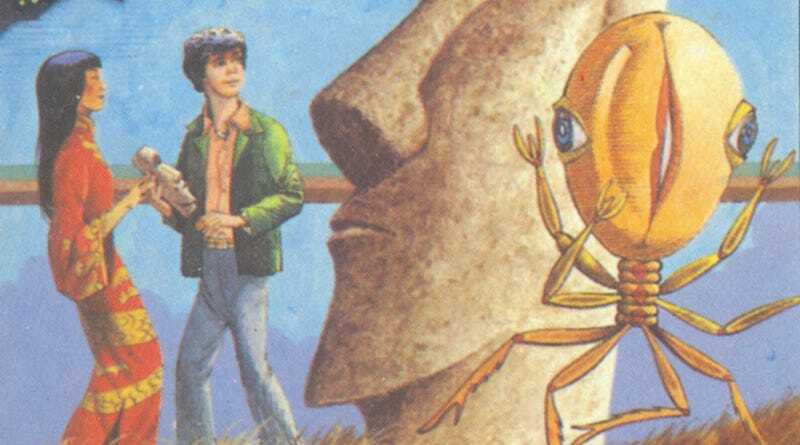 Inside UFO 54-40 was published in 1982, the 12th book in the CYOA series. It was written by Edward Packard, the man who invented Choose Your Own Adventure. It's written in the 2nd person, which is typical of the series. The protagonist ("you") is given no personality or background — in the illustrations, "you" appears as a generic white male teenager. We can assume some degree affluence, as the story begins aboard the Concorde, flying from New York to London. When the plane reaches the exact coordinates mentioned in the title, a cigar-shaped craft appears and "you" are teleported aboard. It's probably the last time you'll ever see your family, or Earth for that matter. Aboard the Rakma, you meet aliens called the UT-Y. They've been cruising the galaxy for thousands of years searching for an idyllic, utopian planet called Ultima. They can do this because no one on the Rakma ages. From there, you are free to wander the halls, meeting other Earth-folk who've been kidnapped from different eras, along with some cartoony aliens with strange powers. The book makes you feel unsettled fairly quickly, because your goal is never clear. Some storylines lead you to try to escape the ship and return to Earth. Some of them have you seeking Ultima. Some of them have you doomed to "SOMA," an exile where you sleep for a billion years. Most of them result in bizarre space deaths that even now don't make a lot of sense. It's the Ultima stuff that makes this book so truly weird. There are a few endings where you successfully return to Earth and are reunited with your family. But when you do this, it feels unsatisfying. I distinctly remember feeling like I'd failed, because Ultima was out there if only I could find it. So you'd do the book over again, making different choices, always getting closer to Ultima, but never reaching it. Because there was no way to reach Ultima. It's there in the book. It's on page 101. But no choices will get you there. You can only reach it by thumbing through the book and finding it. It even acknowledges that you had to cheat to get there. Which means that even if you do find it, it's still frustrating. That's a whole lot of ambivalence and ambiguity to lay on an 8-year-old. I can only win by cheating? There are no correct answers in life? Or is it some kind of Zen koan about achieving happiness? I spent a couple sleepless nights staring at the ceiling trying to understand what UFO 54-40 was telling me.